Doha, May 8, 2018: Education Above All (EAA) Foundation through its programme, Reach Out to Asia (ROTA), held the largest annual International Education and Resource Network (iEARN) Qatar 2018 Open House on April 24 at Hamad Bin Khalifa University-Student Center, under the patronage of Qatar Chemical and Petrochemical Marketing and Distribution Company (Muntajat) Q.J.S.C. Organised in partnership with the National Center of Educational Development at Qatar University and Ministry of Education and Higher Education, it offered students and teachers a chance to display their work & achievements and showcase their iEARN projects for the 2017-2018 school year. The International Education and Resource Network (iEARN) is a non-profit organization that connects schools and youth organizations worldwide via a virtual network to empower young people, encourage inter-scholastic collaboration, and debate world issues in real time. The programme was an ideal platform for teachers’ development, as participants can take advantage of the collaborative features of the iEARN to meet national requirements, as well as for self-development purposes. Since 2008, ROTA has been the exclusive representative of the International Network for Education and Resources in Qatar and, in partnership with the National Center for Educational Development since 2014, has trained 853 teachers from 120 schools. The iEARN program builds on the basic principle of Project Based Learning (PBL) and empowers teachers & youth to collaborate online in order to connect classroom learning with real world issues. It allows young students to acquire skills in critical thinking and cross-cultural awareness while connecting their learning to real world issues, making learning both challenging and enjoyable. This year, 658 students from 12 schools participated in iEARN Qatar, where they had an opportunity to develop and acquire a sense of global citizenship by cooperating online with teachers and students around the world in projects aimed at making a positive difference in their communities. 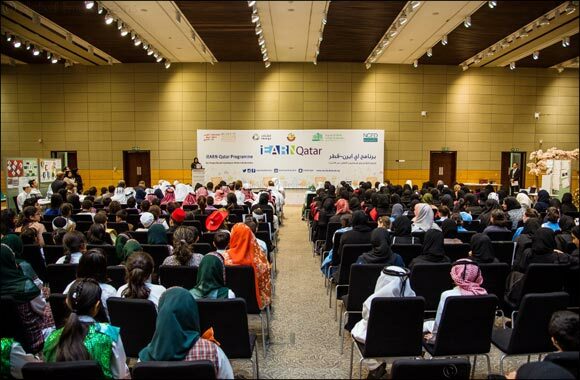 The schools that participated in this year’s iEARN forum were: Al Mahd International School, Iqra English Girls School, Pakistan International School in Qatar, Newton International School – West Bay Campus, Moza Bint Mohammed Preparatory Independent school for girls, Al Ahnaf Bin Qais Independent Preparatory School, Amna Bint Wahab Preparatory for Girls School, Maria Coptic Independent Preparatory School for Girls, Abu Bakr Al-Siddiq Preparatory Independent School for Boys, AlMarkhyia Primary Independent girls school, Al Manar independent Model School for boys. “I hope the iEARN 2018 project has equipped them to collaborate and create public products that apply learning to authentic challenges in the world they live,” he added. Education Above All (EAA) Foundation’s programme, Reach Out to Asia (ROTA) believes in the importance of unlocking human potential as well as the development of human capacities.